"From now on, you may not speak. If you value hastiness, then you will respect my order and I will not hear another word out of your mouths." An imposing figure, Clipper is a police officer on the L.A.P.D. SWAT team. When Clipper gave that order, players listened. Producing a hand-held metal detector, Clipper took players into the alleyway, and began a search and removal procedure. "Into this bag, you will place all your cel phones, walkie talkies, computers, wallets, and jewelry-- anything metal. You may keep only a small amount of cash, your Portable Debugging Device, and Templeton the Rat with you. Finally, I require your van keys, and you will see these items again only after you've finished the next challenge." In silence, all materials of value were surrendered. Simultaneously, a mini-van pulled up and the side doors were swung open. 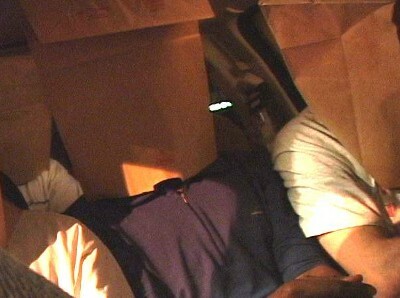 A masked driver stepped out and began to place paper bags over the heads of each now-helpless and silent player, and then he assisted them in stepping into the van. Moments later, the doors closed and the van tore out of the parking lot. Many players took the "No talking" instruction VERY seriously, and didn't talk until after their team was re-united at the Wild Side. This wasn't what we organizers necessarily intended, though it made for some interesting interactions! In particular, when folks had to enlist the help of an innocent casino patron or employee to read the backward-text written on the back of their necks, they needed to do so without actually saying anything! What a challenge that must have been! Also, Clipper did an absolutely terrific job not only of intimidating the players, but also of taking away their belongings. In particular, one of the players (WHO WAS THIS?) had his glasses taken away, and when he found himself abandoned in a casino with a puzzle and a photograph, he was completely unable to see either the clue or the individual in the photo, and so ended up waiting out the emergency period and then asking people inside the casino to help him identify the subject of the photo. Finally, even the fact of a whole team in a mini-van with bags over their heads elicited some response from Vegas tourists. In particular, the van driving the Purple team came to rest at a stoplight and a car full of bachelorette-partygoers pulled up. The women tried to goad the players into removing their bags, but none would. Finally two of the women in the nearby car decided to see just how intense the teams were, so they yelled out and began to kiss each other. Although the driver ("Nick") claims he was too busy trying to drive to look, he indicated that the cameraman shooting the documentary got to watch the show. And catch it on film. Of course, the staid & focused Purple team didn't flinch at all. It was tricky to figure out how to do this at the lowest manpower cost and fastest time. For the beta game, we actually hired a limousine, and that was our original plan here. Unfortunately, the limos were expensive mostly because we couldn't predict the initial arrival times for teams, or how far apart they'd be spread. We liked the idea a lot, so we switched to mini-vans and supplied our own drivers, all Game volunteers. Getting the fastest-possible route was also hard-- we wanted not more than a 30 minute loop, and it took a lot of testing to get that nailed down. Here are the driving directions we provided to each of the drivers.